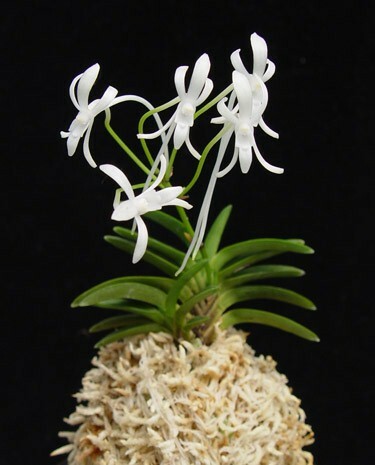 Neofinetia falcata is arguably the first orchid ever to be grown as a house plant in Japan in the 1600’s. It is also known as the Samurai Orchid, as Shogun Tokugawa Ienari fell in love with the plant and it is rumored that samurai would help in searching and collecting the plants from the mountains. It is one of the world’s highest priced orchid (depending on the rarity of each variety), with a history of some plants selling for $100,000+. Neofinetias are enjoyed as bonsai are, for the foliage and the overall presentation of the plant. In Japan, it is said that the key to growing them is to enjoy the plant everyday of the year, not just for the flowers. They generally flower in June and July, and have a very sweet fragrance (somewhat like Jasmine) that is strongest at dusk and dawn. All in all, the Neofinetia is an easy plant to cultivate and flower, and makes for a great addition to any orchid collection. And like so many others, you may end up growing primarily Neofinetia falcata once the bug really kicks in! As with any orchid, use low to no mineral water. Reverse osmosis, rain water and distilled water should be used if your city water is high in mineral content. We mount our Neofinetia traditional Japanese style with New Zealand sphagnum moss. The high mount and perforated pot allow the plant to breath well. Fuukiran like to stay slightly wet between watering from late April until September or October, when the weather is warm and the days are long. If you allow the moss to completely dry out in May or June, neofinetia often abort flowering for the season. Watch between the lower leaves and the axis for flower spikes to emerge. When it is colder and days are shorter, you can place neofinetia in an area that gets as cool as 40 degrees (the 50’s would be ideal). During the cool season, only water or mist the plants on sunny days (if you have high humidity, you don’t need to do this often). Basically remember these plants have a warm and wet growing season, and then a cool and dry season in Japan. We have found that the plants do not require a cool dry rest to grow and flower well. Fertilizing is important in the growing season only, which is from April until September/October. Orchid fertilizer, such as Growmore 20-10-20 or our Green Jungle liquid orchid fertilizer, can be applied every 2nd to 3rd watering. Fertilizer may be cut out 100% in the winter and when the plants are in bloom. Fuukiran are very strong plants, and are quite easy to grow. They enjoy medium light conditions (no direct sun) and can tolerate temperatures from 32 to 100 degrees Fahrenheit. Ideal temperatures would be 60 degrees at night, with a daytime temp in the mid 70’s. Neofinetia can grow in almost any substrate as long as they get good moisture to the roots with good air flow. They can grow in sphagnum moss, bark, bare root in baskets (like Vandas if the humidity levels are high) and mounted on cork slabs. We have tried many techniques and still find that the Japanese sphagnum moss mound works best for us. Repotting is best done once per year in March, which is usually just before or as they are coming out of their winter dormancy. To create the sphagnum mound, long fiber sphagnum moss works best. We often use 5A New Zealand sphagnum moss for the outer layer, and standard New Zealand sphagnum moss for the inside of the mound. Often when opening a 1 to 3 kilo bag of standard New Zealand sphagnum you will find plenty of long strands for wrapping. It is easiest when the strands measure 12+ inches in length. We can’t emphasize how much to your advantage it is to grow these plants outdoors if or when your weather permits. Semi-shaded with brighter morning sun will make these plants grow to their full potential. Be careful not to have these outside when the weather is under 50 degrees and rain is involved. Being too cold and wet is often followed by bacterial or fungal rot. Also remember to keep the plant watered adequately as sun and wind will dry the plants out quickly.